Some people are natural tinkerers. They might pry open the computer to play with the circuitry, pop the car hood to work on the engine or visit the scrapyard to find discarded parts that can be converted into a working robot. These individuals are the next generation of mechanical engineers. But first they need the right college education. Read on to learn all about online mechanical engineering degrees and the careers they can lead to. 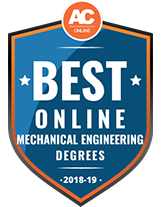 Online mechanical engineering degrees translate well to the virtual classroom by allowing students to utilize the latest area-specific technology as they receive the core knowledge needed to enter or advance their understanding in the field. However, with many mechanical engineering programs now offering online learning options, it can be difficult to sift through each program and their offerings. 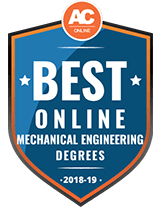 We’ve done the hard work and found the top mechanical engineering programs with online learning opportunities by analyzing schools across the country based on our methodology. Explore these top-notch schools for 2018-19 below. At the University of Alabama, the bachelor's degree in mechanical engineering is offered to students primarily in an online format. The 4-year, 128-credit hour program includes 3 courses that require in-person attendance for weekend labs in Tuscaloosa or Gadsden, and some lower-level general education courses must be taken on-campus or transferred from another university; all other coursework is completed online. Up to 61 transfer credits are generally accepted from accredited institutions, but students should note that technical and military credits are not eligible. Classes in the program cover topics such as fluid mechanics, electrical engineering, the mechanics of materials, thermodynamics, mechanical engineering design and manufacturing practices. Students should be prepared to design and participate in the manufacture of various machines and systems upon completing the program. After graduation, they join the workforce in a wide range of industries including bioengineering, robotics, textiles, petrochemicals, automotive and aerospace. Some students continue their education doing research at the graduate level. Known for educating military-affiliated students, Old Dominion University offers a variety of online degrees in the field of mechanical engineering. The school offers 2 Bachelor of Science in Engineering Technology degrees; both are degree completion programs and are delivered entirely online. The first offers 2 concentration areas -- in manufacturing systems or mechanical systems design. The manufacturing systems concentration emphasizes areas such as robotics and computer-integrated manufacturing, while the mechanical systems design option focuses on the skills needed to design, build and install various systems. The other bachelor's degree is structured around a concentration in nuclear systems, and is open only to students who have specific prior experience in the field. Both degrees require 120 credits total to graduate; students are expected to transfer in some credits, but at least 30 must be taken at Old Dominion; the degree-completion portion takes about 2 years. Old Dominion also offers a 30-credit online Master of Engineering in Mechanical Engineering with an emphasis in Design and Manufacturing. Graduates go on to work in both the public and private sector, in industries such as electronics, construction, manufacturing and energy. Design expertise and management skills are key components of a career in mechanical engineering, and the bachelor's degree in mechanical engineering technology at Indiana State University aims to teach students both. Structured as a degree completion program, applicants must already hold an associate degree and have completed certain prerequisite courses. Once at ISU, students take a total of 86 credits - all offered fully online - to graduate. Over the course of the program, students learn how to design machines, tools and products, as well as how to effectively manage people and how to best utilize the resources at their disposal. The 71 credits of engineering courses cover topics such as graphics, solid modeling, computer aided design (CAD), robotics, and materials; there are also 12 credits of required science and math, and a 3-credit technical elective. Graduates are prepared for jobs that entail the design, manufacture, installation, maintenance, testing and evaluation of products and systems. Located in the heart of America's automotive industry, the University of Michigan-Dearborn has a history closely tied to engineering. Students who pursue a bachelor's degree in mechanical engineering at this school get a broad-based education that prepares them to deal not only with machines, but also with people. Offered in a hybrid format, with both online and on-campus courses, the program requires 128 credit hours to graduate, typically completed over 4 years. More than half of UMD's students transfer from other institutions, and the university does accept eligible credits; there are also scholarships earmarked specifically for transfer students. The curriculum includes both major-specific coursework and classes to satisfy the Dearborn Discovery Core, a set of courses required of all undergraduates and designed to give students a broad educational background. Graduates of the program go on to work for large companies in automotive, manufacturing and healthcare industries, in areas as diverse as biomechanics and biomaterials, water desalinization and prostheses. The Bachelor of Science in Mechanical Engineering at the University of Massachusetts-Lowell is designed to prepare students for support positions in areas such as plant management, manufacturing, engineering, product testing and quality assurance. Graduates receive broad foundational knowledge in how to design, manufacture and test devices and systems. The program is offered in a hybrid format so that students will take some classes online; most courses, however, are delivered on-campus. The bachelor's degree requires 124 credits to graduate; there is also an associate degree option in mechanical engineering which requires 68 credits and can be applied to a future bachelor's. The bachelor's degree can be completed in 4 years, but may take longer for some. In either case, the department recommends that first-year students acclimate themselves to the program and workload by only taking 1 or 2 courses during their first semester. Many courses can also be applied to certificates as students progress through the program. The bureau of labor statistics provides the following data about job growth in the Mechanical Engineering industry. As well as the following national median salary data for several different careers in the field of Mechanical Engineering. Mechanical engineering students, just like any other online students, can expect to access their program through a learning management system such as Blackboard. Through this single point of contact, they can communicate with teachers, collaborate with colleagues, and access coursework. Many, but not all, courses are taught asynchronously, meaning that if a lecture is available on the learning management system, students can listen to or watch it at their convenience. While advanced mechanical engineering degrees may be conducted entirely online, any degree below the master’s level typically requires time in the lab. Colleges often approach this by mandating that online students attend a summer program strictly for laboratory credits. Online programs were crafted for convenience. Therefore, students in online programs are quite often working individuals who attend school part time. This is a benefit to other students, who can collaborate and network with peers across industries. For instance, machine manufacturers mix with active computer manufacturers and aerospace engineers. To combat cheating, online mechanical engineering degree programs usually ask students to take exams in a proctored environment, which may be at an affiliated testing site, another college’s testing center, or under the supervision of a work manager or college official. Although the technology used is pretty much the same at home as it is at school, some students will need to update their hardware and software systems. Given the heavy software needed for engineering programs, many schools wisely provide a list of minimum technical specifications. Some online students will need more one-on-one help than others. The best online mechanical engineering programs emphasize student support and will match their students with online tutors. The emergence of online programs has resulted in a wider array of program offerings. Therefore, mechanical engineers of all levels — from beginners all the way to advanced practitioners — can find an online program that aligns with their educational goals. Online mechanical engineering certificate programs can be earned at both the undergraduate and graduate level. A high school diploma with math and science coursework is necessary for applicants to undergraduate-level certificate programs, while applicants to graduate-level certificate programs must hold an engineering bachelor’s degree from an ABET-accredited program. More often than not, these programs, which are designed for students looking to continue their education in a particular specialization, will be made up of four to 12 courses and take less than two years to complete. A certificate program focused on mechanical engineering should include courses in machinery dynamics and electro-mechanical systems. Students may also delve into subjects such as matrix theory and engineering analysis. These two-year programs, which basically give students the background and training on machine operation, require a high school diploma for admission. An associate degree in mechanical engineering gives students experience in designing and building systems such as engines and heaters, while also introducing them to the mechanical engineering process through courses in natural science and the fundamentals of engineering. Nearly all mechanical engineers have obtained a bachelor’s degree, which is meant to be completed in four years, though five years is common too. Several online programs even anticipate six years for part-time students. These kinds of programs are designed for students looking to develop advanced skills in science and mathematics so they can begin their mechanical engineering careers. Bachelor’s programs feature general education courses, and students will often spend their first two years prioritizing courses such as English and history before immersing themselves in the depths of the major, at which point they will focus on design and machine dynamics. Mechanical engineering master’s programs come in two forms: with a thesis and without a thesis. Both are intended for current engineers or recent baccalaureate graduates who are trying to expand their education in the specialization. Programs without a thesis are just as long, with thesis hours replaced by upper-level courses. Students can expect to take around 27 to 32 units, which works out to nine to 11 courses over the span of 18 to 24 months. To be eligible for these programs, students typically need an engineering degree from an ABET-accredited program; specific schools may require additional experience in the professional engineering field. Typically, applicants to doctorate programs in mechanical engineering not only possess education in the field but also work experience. They are ready to do in-depth research in their chosen specialization, such as advanced power systems or space systems. Most program requirements include a master’s degree in mechanical engineering, though some accept students with a bachelor’s degree and related work experience. Either way, students typically must complete master’s level coursework before proceeding to doctoral research. Although earning a doctoral degree in the field indicates mastery of the subject, some programs are geared more toward producing researchers, while others have strong teaching components for future lecturers. There are a handful of courses commonly found across programs because they provide the basic learning foundations for mechanical engineers. Below are a few examples. Introduction to Machining This course covers the fundamentals of manual machine operation. Students learn how to properly use basic hand tools and to analyze a machine’s functions. Fundamentals of Engineering. This course is an overview of many core courses taken by engineers, with topics covered including heat transfer, fluid mechanics and mechanical design. Additional topics, such as ethics and economics of mechanical engineering, are applicable across specializations. Mechanical Engineering LaboratoryStudents will encounter multiple labs over the span of their degree. Laboratory courses let students experiment with instruments and measurements. Students participate in additional experiments with probability theory and physical phenomena such as distribution, correlation, supersonic flow and shock waves. Introduction to Fluid Mechanics Fluid mechanics is its own specialization at many schools, but in this introductory course students cover basic continuum concepts, learn about liquids and gases in static equilibrium, and delve into equations of motion. Along with these topics, students will also get a handle on dimensional analysis and two-dimensional laminar flow. Physics Mechanical engineers will take multiple physics courses during their degree because physics is the study of matter and energy, both of which are utilized by machines to function. Mechanical engineering students will learn about everything from heat and electricity to circuits and optics. Think about specializationsAlthough associate and even baccalaureate degree seekers may prefer a general course of study, mechanical engineering runs the gamut from nanotechnology to airplane dynamics. Students looking for an advanced degree should stick to schools with their desired specialization. Limit yourself to ABET-accredited programs Any mechanical engineering program from the associate to master’s degree level should be accredited by ABET. Indeed, a degree from an ABET program is required by many employers and a necessity to become licensed. Determine how labs are handledEngineering programs involve a lot of work in math and science that can be done from home. But the coursework may also be loaded with hands-on engineering work originally intended to be done in a lab setting. Ask how the school approaches tactile coursework for online learners. Read the sticker price Now that your list is looking smaller, research the financial requirements for your chosen programs. Are they realistic for your current situation? If not, find out what you are eligible for in terms of financial aid so that cost does not interfere with earning a quality education. Ask questionsWill the program’s department help you find a cooperative education program or internship? Do faculty members offer research assistant positions? Accreditation is a highly important consideration for students. For one, it tells them ahead of time that the school and/or program has been properly vetted, saving applicants the time they might otherwise spend ensuring the program is academically sound. Like other engineering disciplines, the Accreditation Board for Engineering and Technology, known more commonly as ABET, accredits both online and campus-based mechanical engineering programs. ABET is most concerned about students’ experience and how well they are able to learn from a given program. Learn more about engineering accreditation. Having a step-by-step outline of what needs to be completed before the start of an application process can remove a lot of stress. Decide to earn a bachelor’s degree. Take the SAT or ACT, if required. Choose several schools with a bachelor’s program in mechanical engineering. Take the time to research, understand and narrow down your options. Make sure you have the requisite GPA and SAT/ACT exam scores by checking the school’s admission guidelines. Give yourself enough time to apply. You may be asked to submit a personal essay, faculty recommendations and high school transcripts. Start gathering these materials as early as possible. Prospective mechanical engineering students can take any number of preparatory steps — regardless of their desired degree level — to get an edge when applying to programs. Participate in robotics competitions and science fairs in high school. Engineering-related extracurricular activities demonstrate an understanding of science and mathematics. Take AP-level calculus, chemistry and physics. These courses are the building blocks to advancing a career in mechanical engineering. Get your hands dirty and make something.Engineers use metals and plastics, not simply equations. Take all of the skills and notions you have acquired, and build something with them. If possible, do this with other people — it will help open up doors for contests and networking opportunities. Take electives in drafting and computer-aided design. With so much being created via computers, it is important for mechanical engineers to have the skills to design machine parts and systems. When moving toward a future in mechanical engineering, it is important to have a general idea of what direction you prefer to go. Below are just a few job options to choose from. This career option supervises the technical staff of a given company when working on engineering projects. An important feature of this job is to make sure that these projects meet deadlines and stay within budget. Project engineers also make sure that effective communication is taking place among staff. Analyzing technology, resource needs and market demands are a large part of this job. Engineering managers spend time consulting and negotiating with clients when preparing a project, coordinating and directing all types of engineering activities, and proposing new ideas and explaining reports to clients. These engineers apply their knowledge of mechanics specifically to cars, designing and testing everything from energy-efficient engines to durable suspensions. Technicians can jump into the field with just an associate degree. They serve as mechanical engineers’ assistants, recording data from experiments as they work together to design and test machines. These engineers use plastics, metals and other existing materials to create new materials that can be used for specific products. They spend a lot of time designing and testing products, so mechanical engineers with hands-on experience in semiconductors might find a home in this career. To advance in their profession, mechanical engineering grads can choose to pursue state licensure as well as several professional certification options. Offered by the American Society for Quality, this certification is available to working mechanical engineers who are proficient in quality checking and solving quality problems. Mechanical engineers with a bachelor’s degree and at least five years of experience can earn this certification from the International Council on Systems Engineering. The International Fluid Power Society has nine certifications available for mechanical engineers specializing in fluid mechanics. For the Fluid Power Master Technician certification, applicants must pass a written exam and hands-on assessment. The American Society of Mechanical Engineers has several certifications. The GDTP measures mechanical engineers’ understanding of drawings using the ASME Y14.5 Standard. A second, more advanced certification asks engineers to apply geometric controls to such drawings. Engineering is a large field with many disciplines and specializations, many of which are closely related. So before applying to a mechanical engineering program, it’s a good idea to check out similar programs, such as the three listed below. Online electrical engineering degrees revolve around the notion of circuits. Topics will include the relaying of energy via circuits, circuit theorems and circuit applications. Online civil engineering programs are more geared toward structural design. Along with a full course load, students enrolled in these programs will become involved with the highly technical aspects of civil engineering, such as qualitative and quantitative statistics and soil mechanics. Because this occupation is one of the fastest growing in the nation, all higher education programs with the specialization are fairly intense. Topics include subsurface flow simulations, collaborative oilfield systems and oil recovery. Most online master’s programs in this area are less focused on a student thesis and more likely to require research projects.